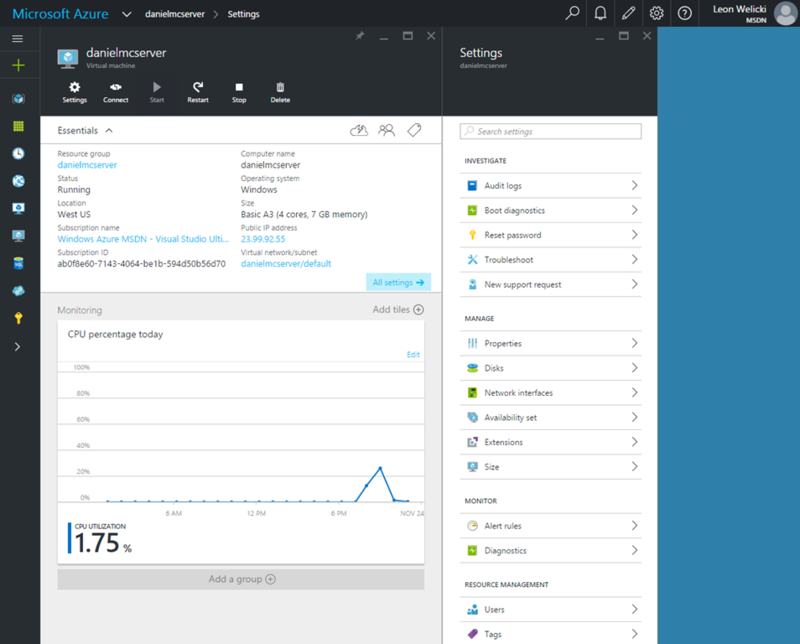 Today we are proud to announce a new set of improvements to the Azure Preview Portal. Like last time, all these enhancements are in response to the great feedback we’ve received from you. We’re very grateful for your feedback and look forward to more of it! In our last update we improved our main navigation experience and, as a result, browsing through resources became more easily available and therefore the most common entry point for managing resources in the portal. In this update we made the next step and improved the browse resources experience. When you are browsing through a list of resources and click on a resource, the browse blade is now automatically collapsed to a list that displays only resource names. If you close the resource blade, then the browse blade is restored (it expands and shows all the columns again). This experience makes it easier to both navigate through a list of resources and focus on one resource. Notice the width of the browse blade has been increased. Also, more resource types now provide additional columns that can be added to the list of resources. For example, the image below shows a list of classic Virtual Machines enriched with the DNS names, size, and VIP columns. The default dashboard has been simplified and made more about you. The first tile is All resources and provides access to your resources directly from the dashboard. 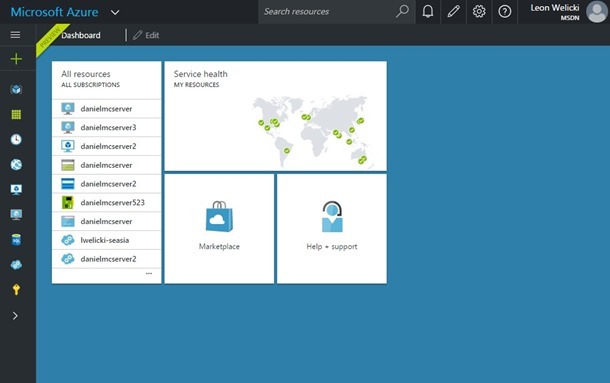 The other default tiles provide access to Azure Service Health, the Azure Marketplace and Help and Support. 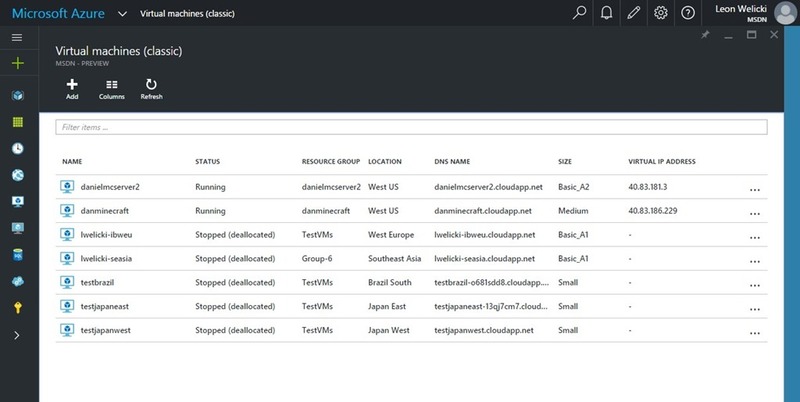 The All resources tile shows the first items in your resources list (sorted alphabetically), but once you use a resource it is automatically moved to the top of the list. You can access one resource by clicking a row in the list or the full list of resources by clicking on the tile container (e.g. in the title). The number of resources displayed in this tile depend on its size (which you can control). We learned from your feedback and our usability studies that notification were very easy to miss. So we updated them so they’re now more noticeable and discoverable. If you don’t like the toast behavior, you can turn it off using portal settings. We have made Marketplace Search available as soon as you open the New menu. We have applied this pattern to some of the most used resource types (Web Apps, Virtual Machines, Storage, etc.). The result of this change is improved performance, simpler default interaction model, and improved consistency across all resource types. The image below shows this pattern applied to Virtual Machines. If you to want add more tiles to your resource blade, we made it very easy to open the Tile Gallery from the blade. We have simplified the default dashboard and made the Tile Gallery available from the dashboard, so you can easily add more tiles to it. The existing pinning experience (pinning the tiles you like as you navigate the portal) is also still available and is a great complement to the Tile Gallery. These are the two ways of configuring your dashboard. It is important to mention, not all resources expose tiles in the Tile Gallery yet. In the upcoming weeks more resources will be progressively offering their tiles. TL;DR: In early December we will do a one-time reset of blade customizations so you can take advantage of all the latest performance and usability improvements. This will not affect dashboard customizations. This reset will not affect the customizations on your dashboard. This reset will not affect other user preferences like your preferred language or theme. As mentioned above, the default layouts for resources will have fewer tiles than before. You can still add those tiles to your blades or the dashboard using the tile gallery. In fact, it’s easier than ever to add tiles to a customizable blade. We’ve added new controls to make that possible. We hope you’ll enjoy the speedier, Azure portal. We have made some updates to our visual styling. The most noticeable one is the improvements made to the dark theme. 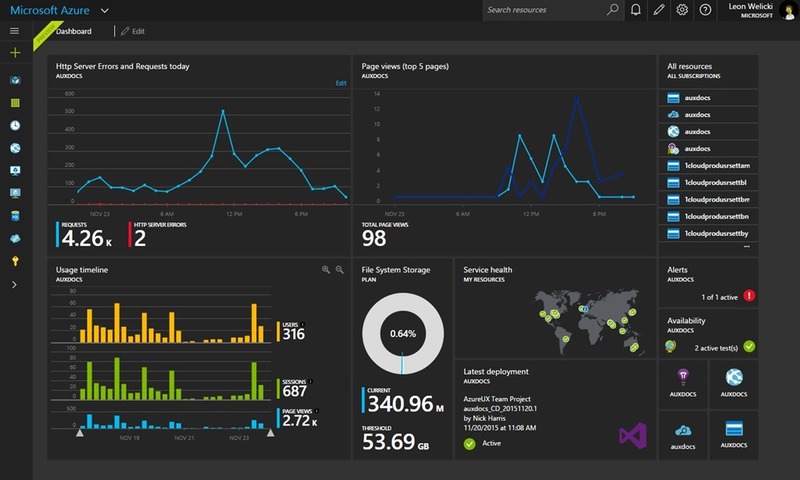 The image below shows a customized dashboard using the updated dark theme. We had set a quality bar for ourselves in terms of usability, performance and reliability that we needed to meet in order to make the portal generally available (GA). Our team has been hard at work improving on those areas and we are glad to share that we have met those quality bars. As a result of that we will be making the portal GA very soon! It is important to mention that general availability does not mean either our commitment or investment to user experience, quality and agility will be reduced. On the contrary, we will keep innovating and improving at an even faster pace than we have been in the past. Please stay tuned for an update on general availability. We will have news to share very soon! As always, I’d like to close with a big thanks to YOU. Your feedback has driven the work for this update and all the work we are currently doing.